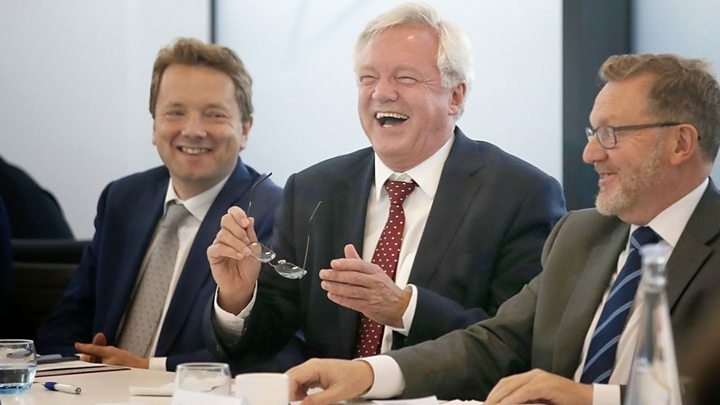 The former chief of staff to Brexit Secretary David Davis has said leaving the EU will be a "calamity for our country". James Chapman claimed two cabinet ministers had expressed interest in a new centre party to oppose Brexit. He also claimed that the Conservatives will struggle to win a majority again. Pro-Brexit Tory MP Jacob Rees-Mogg said the party was "broadly united" and most voters accepted the result of last year's referendum. Mr Chapman is the Daily Mail's former political editor and was a senior adviser to former Chancellor George Osborne before becoming Brexit Secretary David Davis's chief of staff. He quit the government before June's general election and now works in public relations. What chance for a new 'centre ground' party? In recent weeks he has launched a series of social media attacks on his former Brexit-supporting colleagues, including one message which appeared to be aimed at Boris Johnson: "Let's be honest, if we had an effective electoral law leading Brexiteers would now be in jail. #wheresmy350maweekboris." In June, he accused Prime Minister Theresa May of taking an "absolutist" position on some aspects of Brexit policy and of having "hamstrung" his former boss Mr Davis. He has called for a new party - called the Democrats - to oppose Brexit. Speaking to the Today programme, he claimed that the "two main parties have been captured by their fringes". He claimed that two cabinet ministers and "a number of people who have been in Conservative cabinets before now - better cabinets, I might say, than the current one - and a number of shadow cabinet ministers have also been in touch. "They're not saying that they're going to quit their parties but they understand that there's an enormous gap in the centre of British politics." He added: "My view is that the Conservative Party brand has now been damaged to such an extent that the party won't... ever again get a majority. "Don't forget that 60% of the Tory parliamentary party were for remain and now they're paralysed. They won't say what they think." Mr Rees-Mogg, who campaigned for a vote to leave the EU ahead of last year's referendum, said First Secretary of State Damian Green campaigned to remain in the EU but now "is playing a crucial role in ensuring government policy is delivered". He added: "I think most people in the higher levels of the party and across the Conservative Party and the nation have accepted the democratic result of the referendum." On the subject of a new anti-Brexit centre party, he suggested: "Their proposed name ought to be the oligarchs, rather than the Democrats." The Conservative backbencher argued that the Liberal Democrats campaigned at this year's election on a policy of giving voters a second referendum on a final Brexit deal "and the electorate blew a raspberry at them". New Lib Dem leader Sir Vince Cable has said he wants to occupy the "vast middle ground in British politics that's largely been abandoned" and has proposed giving voters the option of "an exit from Brexit". Reacting to the claim that two cabinet ministers have expressed an interest in a new anti-Brexit party, Sir Vince said: "The Liberal Democrats will provide a home for all those who are unhappy with Brexit and the paths the other parties are taking. "But equally we are prepared to work with people of all parties and none to get the best possible future for this country." Mr Chapman's interview follows a call on Twitter for Conservatives and others to jump ship to a new party and for a new referendum in 2019. "Past time for sensible MPs in all parties to admit Brexit is a catastrophe, come together In new party if need be, and reverse it #euref19," he tweeted on 8 August. And he has taken aim at government ministers including Transport Secretary Chris Grayling, tweeting: "Hello @chrisgraylingmp - can you confirm airlines won't be able to sell 80% of flights from next March? How are bilateral deals coming?"